At Maker Faire New York, we met up with student Toby Goebeler of Dover High School, Pennsylvania, to learn more about his Tic-Tac-Toe Robot. Uploaded by Raspberry Pi on 2017-12-18. We came to see Toby and Brian Bahn, physics teacher for Dover High School and leader of the Dover Robotics club, so they could tell us about the inner workings of the Tic-Tac-Toe Robot project, and how the Raspberry Pi fit within it. Check out our video for Toby’s explanation of the build and the software controlling it. 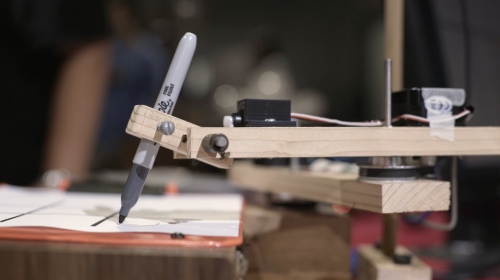 Toby’s original robotic arm prototype used a weight to direct the pen on and off the paper. He later replaced this with a servo motor. 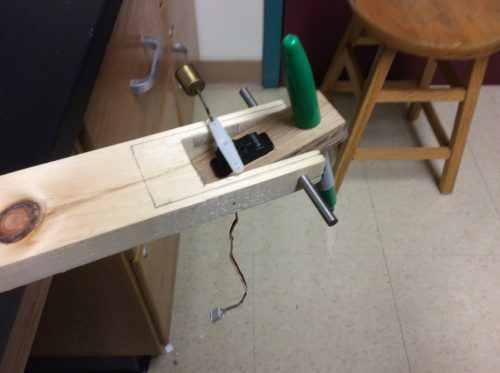 Toby documented the prototyping process for the robot on the Dover Robotics blog. Head over there to hear more about the highs and lows of building a robotic arm from scratch, and about how Toby learned to integrate a Raspberry Pi for both software and hardware control. The finished build is a tic-tac-toe beast, besting everyone who dares to challenge it to a game. And in case you’re wondering: no, none of the Raspberry Pi team were able to beat the Tic-Tac-Toe Robot when we played against it. We always love seeing Raspberry Pis being used in schools to teach coding and digital making, whether in the classroom or during after-school activities such as the Dover Robotics club and our own Code Clubs and CoderDojos. If you are part of a coding or robotics club, we’d love to hear your story! So make sure to share your experiences and projects in the comments below, or via our social media accounts. I thought that game was called noughts and crosses? This is excellent work! Very nice job on the project and way to see it through to the finish! Congrats to Toby and his teacher — this is a cool project, combining many software and hardware technologies. It would be great if they shared something about the tic-tac-toe program that decides the robot’s moves, too. Did they write one from scratch? Can it play a “perfect” game or can it lose, too? Would love to learn how they approached programming the robot’s moves. Hi. I’m the adviser for this project. Toby wrote the AI for the game in Python from scratch over about two weeks. (That, it turns out, was the easy part.) It cannot be beat. He did add a variable introducing random error to make it “beatable”, but the semester ended before he was able to install the hardware “difficulty” knob. You or me can contact him via the Dover Robotics blog that is linked in the article above. Who has time to solve these? !